Story: The narrator anxiously awaits the arrival of her sister, who is still inside Mama's belly. She asks questions, like, "Does my sister know me already?" and, "Will she have freckles?" She sings to her sister and imagines rubbing her back when she cries, giving her a bath and what she will say to her when she meets her. She also notices the way in which things are different. 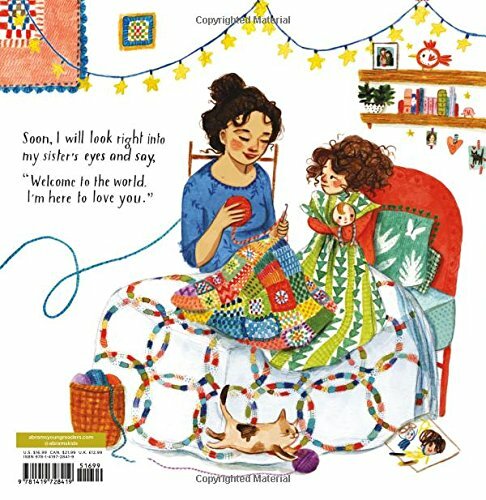 She asks Mama if her lap will ever come pack and wonders if she will have to share her quilt with her sister. Mama is too tired to play, so she draws a picture of an "energy machine" to keep her going. The story ends with the narrator resting her head on her Mama's belly ad stretching her arms around it until she is, "hugging Mama and my sister at the same time." 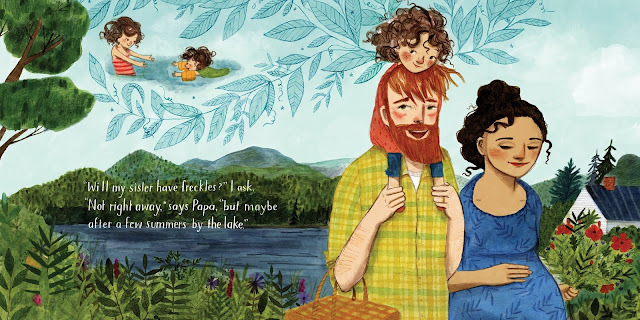 Pictures: Halpin's illustrations capture the warmth, love and creativity that this family (and story) is filled with. Her colorful illustrations bring to life the natural world as well as the cozy world inside the family's home. I wish I could crawl into every magical page of this book, which takes me back to those final weeks when we waited for a new sibling to arrive. Why Read? Why Buy? 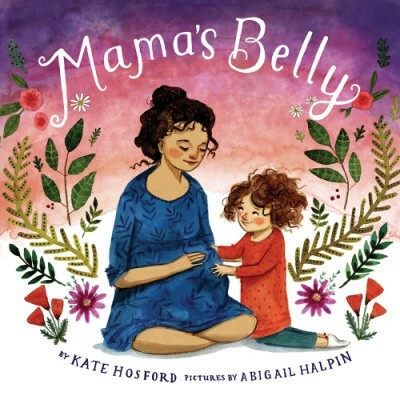 : While Mama's Belly is ideal for a 3 - 5 year old child, especially a little girl who will be getting a little sister, I believe that this book is valuable to all families expecting a new arrival (whether a second child or a fifth) because it is overflowing with love and generosity, patience and kindness. I wish I had this book for my daughter when we were waiting for her brother to arrive. She was four and perfectly poised to benefit from this book. I also believe that Mama's Belly is a wonderful book to read after a sibling arrives. 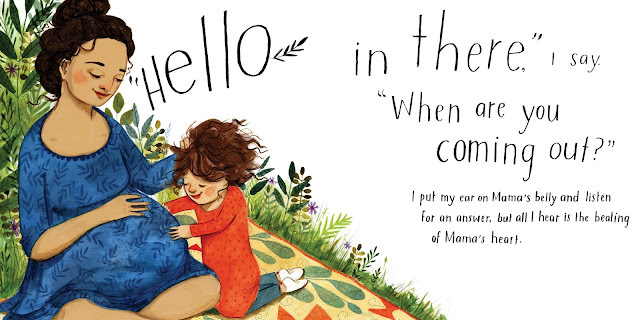 As the mother and daughter in the book look back at photos of the narrator's first day in the world, reading (or re-reading) this book after a baby arrives is a marvelous way to remember and reconnect with your first born.